She quietly hums to herself, her fingers linked and resting as she stares at the cloudy sky through the cracks in the foliage above. A bird calls in the distance and she doesn't move or react. She lets her eyelids slide shut, waiting as patiently as her heart and body will allow. The bird calls again, and this time, it is closer. 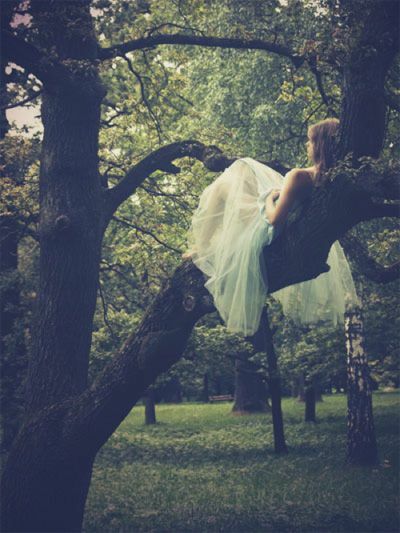 She shifts in her spot on the low tree branch, anticipating, trying her best to keep herself relaxed. But her heart beats rapidly in her chest. How long has it been? How much longer shall I have to wait? "Chirp, chirp." Says a voice beside her ear. As her heart jumps up to her throat, she turns her head and opens her eyes. His round orbs shimmer back, a welcoming sight in the growing darkness of the forest. Swiftly, because she cannot wait any longer, her fingers find his hair and their lips meet after an eternity of chaotic wait. She finds herself shifting off her tree and into his arms, his feet moving to press her back into the scratchy bark. Her heart thumps even faster in her chest, as they break their kiss to breathe. "I've come back for you." His gasping words drift into her ear. "I know." Is her whispered reply. "Will you allow me to take you away?" His tone chokes with emotion and a small smile moves her lips. He's asked her this before, and she finds herself remembering the day that was so full of love and loss her closed eyes fill with the dreaded tears she's tried to keep hidden from the world--and him. "Yes," she whispers, her own voice swelling with emotion. He moves her away from the tree, setting her down on her feet. Though her eyes are still closed she can feel his warmth--his love and joy--radiating toward her in an ecstatic wave of bliss. She opens her eyes, looking first at his parted lips that curl up into a smile, then to his glistening eyes that rock her world. "'To the place where the sun sets and the moon rises.'" She pauses, letting him finish her phrase. "'And the ocean meets the land where the birds touch down.'" She moves in to touch their lips again, wrapping her arms around his neck to keep him from leaving her again. So many times he's left, and every time he seems to return. But she doesn't like to take her chances. "Are you sure?" He breathes against her mouth. "I'm sure." She inhales before diving into another emotional tide of euphoric enchantment. So this is what it's like to have someone take you away. and we wonder how to mend ourselves. p.s. yeah, that quote up there? Ohhhhh the understatement of the century, that was PERFECT, flawless, breathtaking. You are amazing, I can't find words to explain your perfection. Daw. :) This is so adorable—and, as you said, dramatic. I love how you put "chaotic wait" together. It just looks so pleasant and expresses the way they feel. Nice job! Okay... you just need to like stop for a moment, okay? I'm trying to take in all this flawlessness and I'm about ready to burst into tears. The quote; ugh! How do you do it?!?!?!?!?!?! Sorry girly, but I don't think I can...nor do I want to. o.O Wait--if you're gonna cry, I'll stop. *blushes and ducks head* I-I don't know.